THE BRUSH DISPOSAL SITE . . .
Oracle Firewise Board and Oracle Fire Dept. • Two Loads: (truckbed plus trailer) $5.00 NEW! • Commercial-size load: (dump truck) $10.00 NEW! Remember, items gladly accepted are: tree trimmings and brush. Items NOT accepted are: cactus, garbage, lumber, stumps, paper, plastics, metal, fluids and site-cleaning materials. WE ARE OPEN ALL DAY, EVERY DAY! THE BRUSH DUMP BURNS! (7/21/14) After seeing the piles start to build up, our long-awaited burn at the Oracle Brush Dump occurred in July 2014 and It was a very manageable fire. The brush burned much slower than predicted it would; we actually had to encourage fire growth by torching out ahead of the fire. Humidity in the 30% to 40% range is ideal burning conditions and we are currently at 40%. We had 23 Department of Corrections Wildland Firefighters watching over the fire, plus our OFD on-duty crew. We had a complete burn and met all objectives. Shown here is Oracle and Florence Wildland crews working together to burn brush at the Oracle Firewise Brush Dump. 7am to 5pm, every day! Local citizens are required to obtain permission to use the site by checking out a gate key available at the fire station. Please bring exact change. HOW IT STARTED . . . The Oracle Brush Disposal program began in the mid to late 1980s. 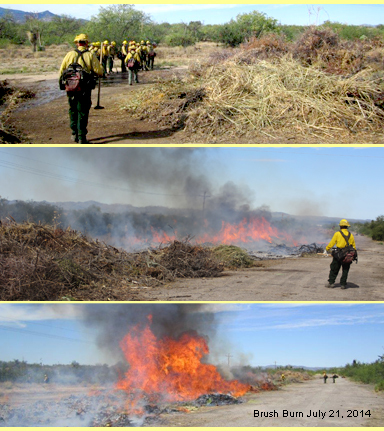 During the early years of the program, Pinal County and the Oracle Volunteer Fire District, provided equipment and volunteer manpower to collect and burn vegetative waste products approximately six times per year. The collection site was at the current location of the Waste Management Transfer Station on East American Avenue. 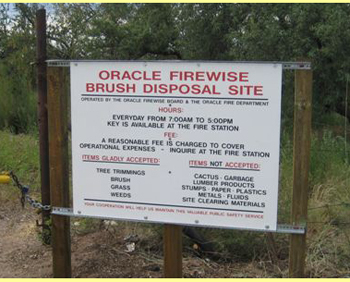 After the Aspen Fire of 2003, Oracle Fire Department officials decided that the community of Oracle needed to implement a Firewise program. The Oracle Fire Department hosted several public meetings and workshops, and community interest in the Firewise program quickly developed. During those meetings and workshops, local citizens expressed much concern about Oracle's high fire hazard conditions. Homeowners were eager to participate in the new Firewise program in an effort to help their homes survive a catastrophic wildfire. Many of them aggressively began creating defensible/survivable spaces around their homes by removing flammable items such as grass, brush, low hanging tree limbs, etc. The East American Avenue brush disposal program quickly proved to be inadequate for the large quantities of brush that home owners were now removing from their properties. An alternate site was selected on West American Avenue, and with the help of the Arizona State Land Department, a "right to use" agreement was entered into. Oracle was divided into quadrants and community volunteers staffed the new brush disposal site. Each Saturday people living in one of the selected quadrants were allowed to bring as many loads of brush as they could during that day. The popularity of the Firewise program grew so quickly, that every 4th Saturday simply wasn't enough to accommodate community brush disposal needs. The Oracle Fire Department and the Oracle Firewise Board decided that the brush disposal program should be managed by the fire department. A small fee schedule was adopted to cover the anticipated costs of managing the site. Check HERE for more photos of the Brush Disposal Site and our staff in action. The Site is open to residents of Oracle. Items gladly accepted are: tree trimmings and brush. Items NOT accepted are cactus, garbage, lumber, stumps, paper, plastics, metal, fluids and site cleaning material. BRUSH BURNINGS . . . The collected brush is burned multiple times per year depending upon weather conditions. 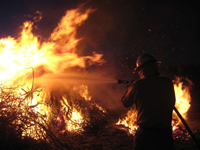 Burning and extinguishing the brush has become a popular method for training new firefighters. Firefighters learn how to properly use various ignition devices, also operating fire engine pumps, deploying hoses, nozzles and providing various methods of water delivery.